Farmers rely on their equipment everyday to run their farms. It's imperative to have good data on how each piece of equipment is used and how much it costs to operate in order to optimize machinery to it's fullest potential (read more about machinery optimization in my past post). To collect data in real-time, AgCo has developed AgCommand, a device that collects data about a specific piece of equipment and delivers the information via a cellular modem and GPS in the device to the AgCommand website. The website gives reports that track engine hours, fuel consumption, operator efficiency, equipment health info, and field-specific machine information. Reports can be used to monitor and control operating costs and for planning, billing, and maintenance scheduling. This kind of information would be very helpful in making decisions on how to best use your machinery. Figure 1. Example map of a farmer's land and an AgCommand report on the working time of a piece of equipment. 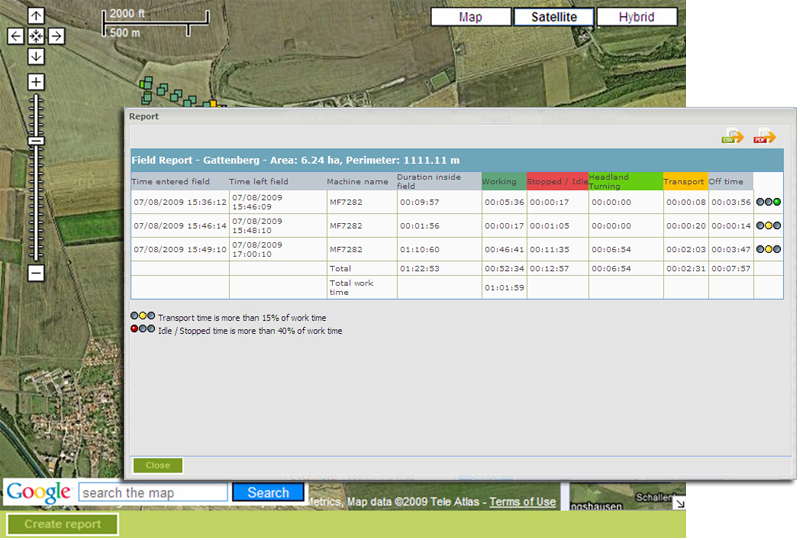 Another great feature of the AgCommand system is geofencing. As Farm Industry News describes it, geofencing "allows the user to build a virtual fence around equipment using GPS coordinates. So when equipment leaves the fenced-in area, the telematics system sends a text message or e-mail alert. This can help avert theft, or simply let you know that your planter, sprayer, or combine has finished work in a field and is moving on to the next. Similarly, telematics curfews can alert you when a machine is started after working hours." As a farm business owner, have you ever heard of or used the AgCommand system or something similar? Are you willing to try this new technology? Of all of the reports and information generated by the system, what is of greatest importance to you? Can you think of any other data not mentioned here that you would like a system like this to collect? Are you ready to embrace this new technology?